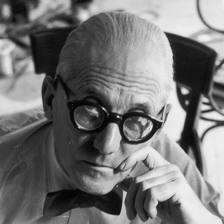 Born Charles-Edouard Jeanneret in 1887, Le Corbusier was and Swiss and French architect. He took his name at age 33, based on Lecorbesier, a name from his ancestry. He was one of the strongest advocates for the application of Phi to everyday life. Originally, he was strongly opposed to the idea, but after he studied it more thoroughly, he became fascinated with the concept. He had long been interested in a basic structure in art. His interest in the arts was fostered from a young age through musical education. Pythagoras was very interested during his life in harmony found in mathematical interest. Le Corbusier shared this interest. He wanted to provide "a harmonic measure to the human scale, universally applicable to architecture and mechanics." At the time he was studying this, other work on proportional systems was becoming widely reviewed. It was a time when the idea that math could solve complicated things was becoming widely accepted. In 1951, Milan Triennale organized an international meeting about proportions, and Le Corbusier was chosen to chair. Le Corbusier's search for a proportional system to create harmony resulted in the Modulor between 1943-1955. The Modulor was similar to the Vitruvian Man is the sense they both dealt with human proportions. In part of the system, a (scale) six-foot tall man with arm raised to 7'5" was inserted into a square. The height of his navel was a golden section of his height. Also, the height of the extended arm was in a golden relationship to the height of the wrist hanging down. The Modulor system was based on the Fibonacci series. It's purpose was to "maintain the human scale everywhere." In 1952, the building Unite d' in Marseille was completed, based entirely off the Modulor. Le Corbusier believed it could give harmony to everything, from door handles and cabinets to buildings and other urban spaces. He published Le Modulor in 1948 and Modulor II in 1955, gaining attention from architecture circles, and was included in any discussion of proportion. The system is seen in the architecture of the Le Corbusier modern flats today. In 1946, he presented Modulor to Albert Einstein. Einstein said, "It is a scale of proportions which makes the bad difficult and the good easy."